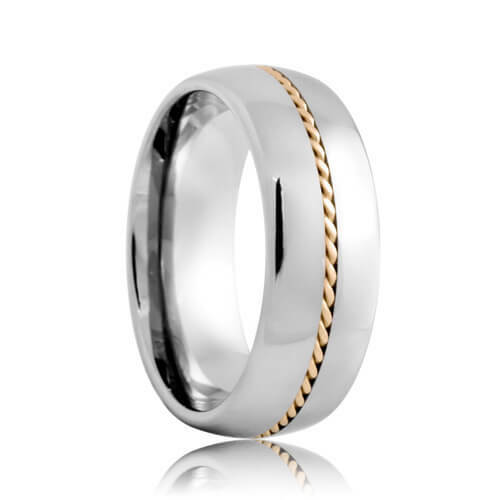 The Shreveport tungsten carbide wedding ring features a handcrafted 18k yellow gold rope inlay hand woven by a master jeweler. The inlay is hand woven and contrasts brilliantly against the cool gun metal grey color of tungsten carbide. The comfort fit interior allows you to wear the ring with ease all day. These styles of tungsten rings are made to order so please allow 5 - 10 business days to manufacture and ship. Free Lifetime Warranty and Lifetime Sizing; pay no restocking fees or deductibles! There is just so much information about tungsten carbide on this website. I was able to learn so much about tungsten carbide rings before I bought my wedding bands. I also sent a few emails to the customer service before I bought the rings and they were extremely helpful. I discovered the website after visiting every single jeweler in town and dealing with pushy salesmen. Being able to compare so many tungsten ring styles and make an informed decision at my own speed was comforting. The price was a big plus also. I'm so happy I found Tungsten Rings Company.